There is no better option than installing Rinnai tankless technology in your residential construction. Our commitment to quality has made Rinnai the #1 selling tankless water heating brand in North America. Your new home buyers deserve nothing less. Why should you build your homes with Rinnai tankless water heaters? Only the size of small suitcase, our wall-mounted models can be installed on indoor or outdoor walls and in compact spaces. Hot water whenever, wherever you need it shouldn't be a luxury. 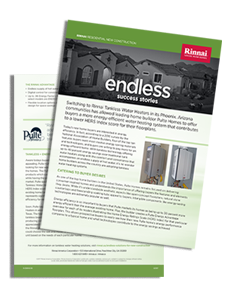 There's no better option than Rinnai Tankless Water Heaters for new residential construction. Enjoy on-demand hot water at the push of a button. Wireless accessories mean no need to run wires to each fixture. Meets California Energy Commission’s Title 24 requirements. Roughly the size of a carry on suitcase, Rinnai Tankless Water Heaters can be installed in compact spaces including attics and basements, as well as outdoor locations.